I heard that there is a way to cook a whole fish in a dishwasher - any techniques, tips?? Cooking in a dishwasher is related to some other non-orthodox places to cook, like on the manifold of a car on a road trip. Basically, you're aiming to put food in an environment that's somewhere between 160F (71C) and 300F (150C) already, for non-cooking reasons. That's strange, but not entirely nuts. The dishwasher is going to stay south of 212F (100C), but, a decent dishwasher doesn't stay very far below that threshold. It's going to go through several variations of how that heat's applied, from the actual washing cycle to the drying cycle. And, if you run a regular cycle of dishes, there's going to be a bunch of foreign substances (soap, food bits from the dishes (and in the car manifold situation, things like oil)) all around it. So, your goal is to wrap the food in something that can both handle the heat and seal out the foreign stuff. To me, the most obvious solution to this is the vacuum sealed pouches used for sous vide. You're not going to get anything remotely close to the consistent temps for sous vide, but for the dishwasher, you're still talking about mostly cooking in "hot water" and hot, moist air, so that's close enough to give a shot. So, I'd fill the pouch with seasonings/marinades and let it ride and see what comes out. I wouldn't expect it to be great, but it might be worth a shot for the shock value alone. Surely the authors of the previous (sublime!) answers will throw the "Sure it works in practice, but does it work in theory!?" at me, but this great SE question and its answers still lured me into creating an answer backed up by empirical evidence. YES! It's certainly possible. At least one successful attempt has been logged (see below). Two whole trouts (each 230 grams, 28 cm long, thickness 3 cm). One salmon steak, cut in two equal pieces (90 grams each, thickest point 3 cm). Lemon slices (only on the trout, not on the salmon). Microwave foil (only on the salmon). Wrap tightly in microwave foil with salt, rosemary, parsley. Push air out of bag, close it. Salt, rosemary, parsley and lemon slices inside the fish. Alas: the zip-lock bags were too small, I had to cut off the head and tail. Rolled up the zip-lock bags a bit. Put one salmon and one trout bag in the top rack, the other two in the bottom rack (to test the difference). With the dishwasher empty, the first bit of the program made an awful lot of noise, with cold water hitting the inside of the empty dishwasher. After that it kind-of returned to normal. Victory! upon closer inspection it turned out the fish were all perfectly cooked! We put some extra salt on and enjoyed them very much. The answer is then a wholehearted "Yes: this is possible!". Try this at home! I would wrap it up in tinfoil with some herbs and spices and maybe some lemon and set it to the pots and pan setting and let it run. I would make sure to temp it before you eat it and make sure that it is fully cooked. Also, you might want to lay it on the top so the steam and water cook it rather than the heating element at the bottom. I would also suggest that you leave the soap out. Let us know how it worked out. P.S. This seems like a very inefficient way to accomplish the goal of cooking a fish. This is essentially a Sous Vide hack (like the beer cooler, which is only slightly less weird). This would probably work best with a newer dish washer that can use cooler wash cycles. A quick google shows some wash cycles down in the 125F to 135F range, which is a common temperature to sous vide salmon. I personally don't like salmon at this temperature and prefer it cooked at either a much higher temperature with conventional methods or sous vide at 113F. If you try this, I would recommend using a dish washer that runs at a cooler temperature. It's also a good idea when cooking fish at low temperatures to buy sushi grade fish and avoid serving to anyone who is immune compromised (kids, elderly, pregnant, etc.). As chris has tested, some dishwashers apparently will hit 45c / 113f. And for everyone that thinks fish in a dishwasher is weird, Heston Blumenthal cooks whole pigs in the hot tub. Now that's weird. In fact, for Salmon, a hot tub may be closer to the ideal temperature for sous vide. However, I do not suggest it (even google doesn't find anyone trying it, and I'd hate to be the one responsible for starting it). I don't think a hot tub would meet cleanliness standards for cooking. I strongly recommend Douglas Baldwin's excellent Sous Vide primer if you want to try this method. He talks in detail about cooking times, effect the size of the fish has on cooking, pasteurization tables, and safety concerns. For this "dish" you want the Salmon Mi-Cuit recipe. In Heston Blumenthal's "Family Food" he says that they cook fish in a 45C stirred water bath at his restaurant. There is another recipe of his where he poaches pears in a dishwasher using sealed and vacuumed "Food Saver" bags. 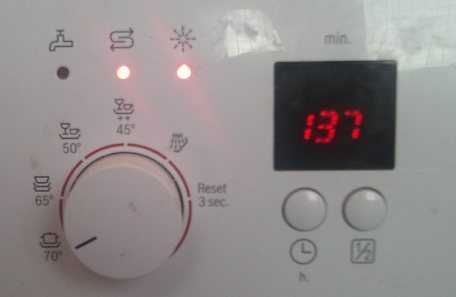 If you have a dishwasher with a 45C setting you could combine the two ideas. He says that the cooking time for a 250g skinless salmon fillet using the water bath method is half an hour. When the fish has been cooked correctly it will "still look undercooked but will flake beautifully". 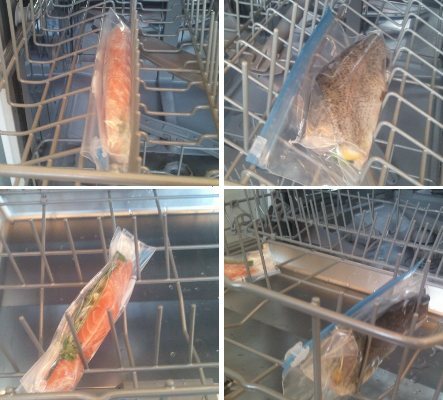 If you are going to try this I would recommend waiting until the dishwasher is well into its cycle before chucking the fish in so that the temperature is up to 45C. At a restaurant I used to work at we used a dishwasher for our whole steamed Red Snapper that was on the catering menu. For catering it's great because you can fit 2 rows of 4 on a rack and do them all at one time. The wash cycle was completely skipped and the fish was steamed using the heated dry cycle. The Red Snapper was first scaled. Tail and head left for presentation and we would stand them up in the swimming position by putting a ball of foil under the belly. Season well with kosher salt and fresh herbs then use a traditional court bouillon and pour fill the bottom of the dishwasher up by about 2 inches. The water input hose was removed and the dishwasher was manually drained with a drain plug after use. They came out perfect every time and could even hold for a few hours before service if we left the door closed after the cycle finished. Place the fish on two large sheets of aluminum foil. Squeeze on some lemon juice and place the pats of butter on the salmon fillets. Seal the fillets well in the foil, and place the foil packet in the top wire basket of your electric dishwasher. DO NOT ADD SOAP OR DETERGENT and NO RINSE AID. Close the dishwasher door, set the dishwasher on the hottest wash cycle, complete with drying cycle, and let it run through a full cycle. When the cycle is complete the fish will be cooked just right. Not the answer you're looking for? Browse other questions tagged equipment fish sous-vide or ask your own question. 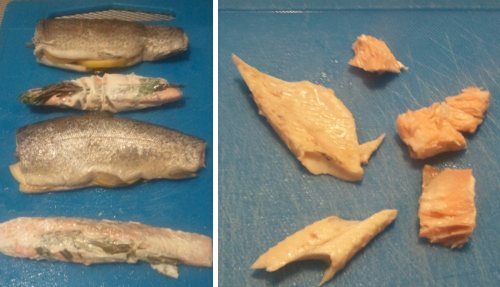 Poaching a whole fish: kettle or foil? I was going to try a recipe for Ceviche - are there any fish varieties not recommended? Cooking times and temperatures for whole fish on the grill? 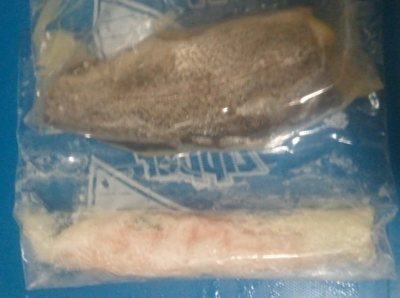 How to tell if fish is subjected to Ciguatera? How do you barbeque a whole piece of fish? 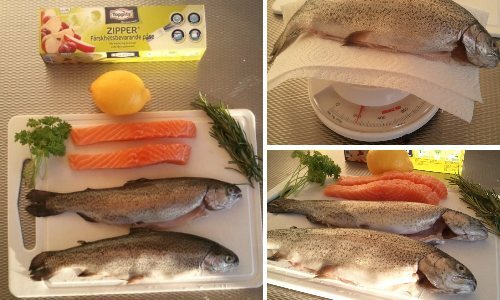 How to cook oily fish whilst minimising odour?